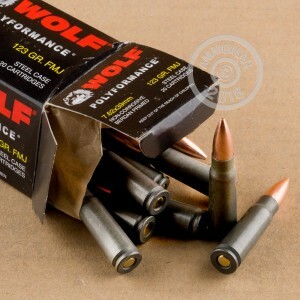 Your SKS or AK-pattern rifle will appreciate thise case of 1,000 Wolf Polyformance rounds (50 boxes of 20 rounds each), which use non-corrosive Berdan primers and polymer coated steel cases. The polymer coatings ensure reliable feeding and ejection, while the steel cases, though non-reloadable, keep the cost of shooting down so you can stay on the range for longer. A standard 123 grain bimetal jacketed bullet provides typical 7.62x39 ballistics. Since the 1920s, Soviet and later Russian ammo manufacturers have made steel-cased ammo to take advantage of their homeland's abundant iron ore deposits. AK and SKS pattern rifles, developed in the 1950s, were engineered to use this ammunition reliably. With the advent of polymer coatings replacing the old lacquering, steel-cased ammo is gaining increasing popularity around the world thanks to its significant up front price advantage. Place an order for $99 or more from AmmoMan.com to qualify for FREE shipping, an amazing deal that can save you big bucks on ORM-D ammo deliveries. Clean, consistent and reasonable ammunition! Fine groups through all of my cold war classics. This Wolf ammo performs perfectly and was very accurate. Put 200 rounds through the c39v2, not 1 hiccup not one problem what so ever. Gotta get more! Thanks ammoman!! Great ammo. Packaging? So so. I've always been happy with wolf ammo. It's always been reliable and reasonably accurate. The packaging from ammoman has always been good for past orders. However, this time it looked like the box came apart during shipping. Everything was there, so I was good with it. Worked great. Good cheap ammo. Used this in a brand new Ruger Mini 30 with Ruger magazines. Worked great. Shot 200 rounds. No issues what so ever. Noticed it was a little dirty when cleaning my Mini the next day. If you are happy just banging away at whatever, this stuff is perfect. If you are trying to obtain 1 minute of angle (1 inch group at 100 yards) I think that will be exceedingly difficult. I took a cartridge apart and miked diameter of the bullet - it went from .309 to .3095. I miked the diameter of a Remington 150gr .308 bullet and it went from .308 to .308. - no runout. However, knowing that a small group with this ammunition will be a total accident doesn't take away from the fun I am having with it. I bought a case of this stuff and when it went on sale, I bought another case. Hey, you can "police" your 'brass' with a magnet too! Have fun! Works exactly as it is supposed to. Great for plinking and target shooting. Reliable, shoots nice out of my CZ 527 and as good as anything else out of the AK pattern rifles. Great plinking ammo. Will buy more soon. Arrived very quickly! Shoots very well in my AR and SKS. No misfires, although a little on the sooty side. Cleans easily. I Broke in my new CZ 527 Carbine with 100 rounds of WOLF. All ammo ran smooth. Good cost effective ammo we use in military style rifles after running this ammo through our guns we wash them out with warm soapy water and oil them down ,probably don't have to be so aggressive with the cleaning but got in the habit years ago.I don't shoot military rifles as much as I used to but the ammo had such a great price I picked up a 1000 rounds to put away for a rainy day. Great price, free and fast shipping, you won't find a better supplier. The order was delivered in a manner of only a few days. Good packaging and the price was right. This ammo will not win you the Creedmore Cup but is quite adequate for most AK applications. Seems to hold 2 to 3 inch groups at 100 yards, maybe a bit larger but perfectly OK for blasting ammo or if the SHTF - TEOTWAWK. Quick delivery ,the ammo is great. No need to shop around this is the place!! This is the second time I've ordered from here. Both times on a Saturday night and got the ammo Tuesday morning. That's fast. Good Ammo! After getting set up with Ammoman shipping has been the same day and quick Fed Ex delivery. I've placed 3 orders with Ammoman and will again! Great prices, quick delivery and no running around... Just go ahead and place an order! If your using WOLF ammo in an AK 47 you cant go wrong. I've shot a couple thousand rounds of WOLF ammo with never any issues. It goes bang every time. Cheap and reliable ammo. All shot had no miss fires . Delivered in less then 48 hrs. Probably due to excess heat and the polymer coating. Folks, ran flawlessly in the am! Great price and fast shipment, overall great service. Highly recommended! Function fine. Great blasting ammo. Went out picked up an AK47...... Wait I need Ammunition. So I look at the prices at the store and said no thank you. AMMOMAN you are "THE MAN" ordered the ammunition late Friday night, and lo and behold like a friggin' Super Hero it arrived at my door today in PA. Will burn off a few later this afternoon, but it's opening day for deer Hunting Season. Ammo arrived in perfect condition and two days sooner than quoted on the shipping tracker. Definitely worth the extra $1.50 for the over box to keep it "safe" from prying eyes on the front porch for a couple of hours before I got home. Great ammo that always works at a great price. I have fired various brands of MUCH more expensive American made ammo and got no better groupings than I did with this Wolf polymer coated Performance ammo. If you do not reload there is simply no reason to pay the extra for brass cased ammo. 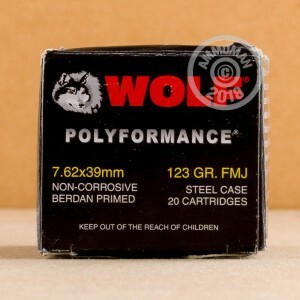 When Wolf went away from sealing their primers with lacquer and went to coating their ammo with polymer they also vastly improved their powder mix which made for a much cleaner burning round, as clean as ANY American brand. This "Performance" ammo is also just as consistent and accurate as any American made ammo and at the cost it makes one want to rethink re-loading anyway and chasing spent cases, especially those thrown the distance most AK's throw their cases, is hardly appealing to me even if the cost of reloading is less than just buying this Russian made steel cased ammo. In short, this ammo is as good as it comes for either your SKS or your AK47 and I would highly recommend it to any and everyone. It is ALL I use on a regular basis though when hunting I do break out my Wolf SP steel cased ammo as it does expand fantastically. Remember also, this ammo tends to tumble wildly once it strikes soft tissue so even though it is a FMJ bullet the wound channel it creates is substantial and catastrophic. GREAT AMMO at a GREAT PRICE! great price and service cycle just as good as 1972 plo copper fmj rounds i have had for many years wolf a little dirty but what does it matter in a ak47 you know what i mean!!! Ammo functioned flawlessly. Great Price. SUPER FAST delivery! Shot very well in both of my rifles, does all what is expected. I'll buy more when I get the cash for sure. Great value, service and quality. Wolf feeds well and always goes bang. I reload several calibers but For Zombies and plinking it's more cost effective and time saving to go with Ammoman. They've got the best prices I've found and believe me I've spent many many hours looking. I've placed several orders through the years and haven't been disappointed yet. Their service is excellent, my last order was placed Tuesday night and was delivered Friday. Typical wolf ammo. Runs great in my guns. Good price. Easy and super fast. I ordered ammo after 12 on a friday and it was at my door saturday . Ammo arrived as stated. Have shot about 100 or so and so far I have had no misfires. I'm sure I will be buying more soon. Runs in gun. What more do you need? This ammo is good to go and cheap! That is all I was asking for. Get some. Great fun to Shoot. I'm able to keep 600rnds in my 50. cal Ammo cans. No miss-fires and is good for plunking. See Ya at the range. This review is submitted after my 3rd order from AMMOMAN. After firing approx 1500 rnds, I have not experienced any hiccups or FTF. May not be the most accurate, however as most know many factors play a major part in accuracy. My groupings are tight with a decent quality Red Dot. The price per round is comparatively cheap compared to Gun Show vendors. FREE FAST shipping is a plus, orders consistently received within a 4 day period (including weekends). Given the fact that I reload my personal Ammo, it would be a HUGE plus if casings were reloadable (life is not perfect all the times). I ordered on THURSDAY and received SATURDAY. Even better than I has stated in the first review. AmmoMan is excellent. Just ordered more. Ordered on Monday, received Saturday! Great price and service that is second to none! AND that is Free Shipping! Amazing. Got delivery (and fast too!). Took ammo and N-PAP to range. Loaded mags. Inserted mags into mag well. Pressed trigger (many times). BANG (X1000). Bullets came out and hit target/paper. This ammo works. I'm happy. The end.